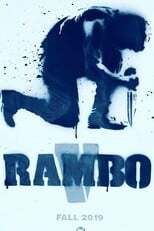 When his housekeeper’s daughter is kidnapped, Rambo crosses the U.S.-Mexican border to bring her home but finds himself up against the full might of one of Mexico’s most ruthless cartels. Rambo 5: Last Blood is directed by Adrian Grunberg, Sylvester Stallone and will premiere on Sep 20th, 2019. Director Adrian Grunberg's Action movie Rambo 5: Last Blood is produced by Lionsgate & Millennium Films & was released 2019-09-19.